In 2016, the University of Manitoba’s Sustainability Department conducted the first ever comprehensive transportation survey, and the results are now in. The survey was directed to staff and students, and resulted in 4,384 people sharing their experiences and providing input on detailed questions around commuting to and from campus/work. Approximately 76% of responses were from staff and students, with an additional 16% from faculty and 8% from non-University employees. 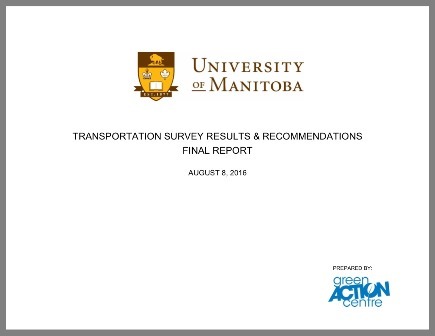 The Strategy resulted in over 80 action items to continue to expand and improve transportation options on and leading to the University of Manitoba’s Fort Garry and Bannatyne campuses. Have comments or questions? You can provide feedback on the survey results and recommendations by contacting the U of M Office of Sustainability.